Driving in Iceland is a diverse undertaking, quite unlike those you will experience in most other countries. On our roads, even the most experienced drivers are sure to frequently find themselves in situations that test their zone of comfort. It is therefore extremely important that foreigners and locals alike, take extra care when driving in Iceland. Below you will find a few helpful tips to aid you on your way. Loose gravel has caused numerous unnecessary accidents. It is common for these accidents to occur where a paved road suddenly changes to gravel. The sudden change in underlayer is known to catch drivers off guard, causing some to panic, hit the break too hard and lose control of their vehicle. Be on the lookout for this sign, indicating a paved road changing to gravel. You should also note that gravel roads are often quite narrow. Therefore, it is necessary to show caution when approaching a vehicle from the opposite direction. When encountering an approaching vehicle, one should slow down considerably and move as far to the right side of the road as possible, allowing both parties to pass without unnecessary endangerment. F roads should not be driven unless you are having a 4×4. These roads are not just gravel roads, these are mountain roads where you might need to cross rivers without bridges. Before going these roads make sure to read about crossing rivers and estimating the depth, there are times that some of these rivers can’t be crossed at all so you need to know what you are doing. When driving in Iceland you will by all probability come across sheep or other livestock on or beside the road. This can cause great danger because if an ewe is on one side of the road, and her lambs on the other, the lambs––alarmed by the roaring approach of your vehicle––are likely to panic and run to their mother’s side. In such a situation you will, therefore, be wise to slow down and honk your horn. This will alarm the lambs and cause them to run to their mother’s side at your command, rather than suddenly shoot onto the road to your surprise. The Icelandic Ring Road is home to many single lane bridges which are extremely hazardous to those unfamiliar with the basic measures drivers must take when encountering an approaching vehicle. The rule is that the vehicle which is closer to the bridge has the right-of-way. Nonetheless, it is advisable to always slow down considerably before crossing––even to reach a full stop––and carefully assess the situation in order to determine the intentions of the approaching driver. Iceland can be breathtakingly beautiful in winter time, but it can be equally dangerous. Winter driving conditions are often extremely difficult, especially for drivers that are not accustomed to an arctic climate. When driving on snowy and slippery roads, locals and foreigners alike need to proceed with extreme caution. And remember that a large portion of the Icelandic road system is not serviced during winter time, leaving some roads closed or impassable. Before heading out, check the Road and Coastal Administration’s website, www.road.is, where you will find an interactive map with road conditions and weather information. If in doubt call 1777. For more information on driving in Iceland, please see the following links. Take care out there. On road.is is the icelandic road and coastal administration. You may find some useful information about travel in Iceland on the safetravel.is website. Drive.is has released a helpful video about driving in Iceland. And remember, Iceland’s Emergency Number is 112. This number is identical to 911 in USA and 999 in UK. 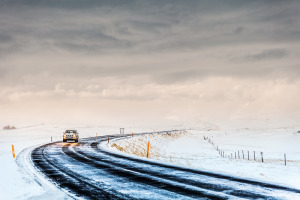 Driving in Iceland: How is the winter season? 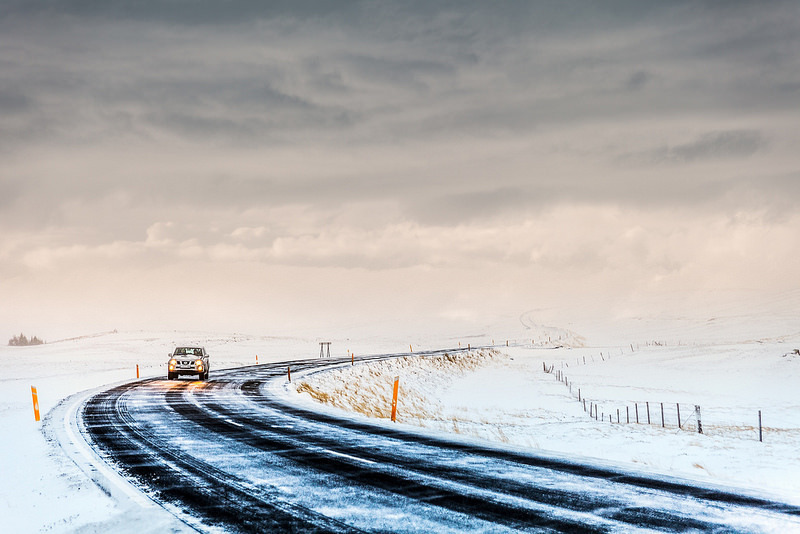 Iceland is an adventurous place to visit, even more so in winter than in summer, but if you’re considering taking the popular road trip on the route 1 ring road in Iceland during winter, you might be wondering whether you’ll cope with the driving conditions. Is the Route 1 Ring Road safe in winter? The ring road is a route that every tourist should experience. It offers breath-taking vistas and incomparable scenery. No matter what time of the year it is, you should be able to find cheap car rental in Iceland and hit the road. However, driving in Iceland can present challenging conditions, even in summer. In winter, you need to be prepared before you set out. Monitoring weather forecasts is important: remember, Mother Nature is not a nice lady to get into a tussle with and weather can be powerful stuff! The ring road is open in winter and most of the time it’s perfectly drivable although there are temporary closures when the weather has been particularly bad. Whatever you do, don’t be in a hurry. Warning signs might indicate sharp bends ahead, but there’s no speed recommendation, so it’s best to play it safe because some of those bends are really, really sharp! Andrés Nieto Porras, December 3, 2013 via Flickr, Creative Commons Attribution. The route 1 ring road has a good surface, most of it is paved and the gravel stretches are well-maintained. If you decide to take one of the gravel side-roads, be aware that some of these routes are incredibly rough and should only be attempted in a 4×4 vehicle! The mountain roads are predictably the most likely to be closed to traffic and for the rest of the year, they’re strictly for off-road vehicles. As for the easier roads, even a cheap car hire establishment should know that you’ll need good tyres, but check this before you leave anyway. Where can you get info and updates? Most car hire establishments would be able to advise you as to what routes are suitable for your vehicle and what sights you should see along the way. Taking the advice of locals is always a savvy way to plan your route. If you’re one of those people who prefer to do everything themselves, you can find information online on the Icelandic Road Administration’s website. Take what they say seriously. If they say you aren’t going to get through, they know what they’re talking about! The weather can be very fickle, so even if you set off in fine weather, you should do a daily check on weather and road conditions that await you. Bearing this in mind, don’t try to run on a tight schedule. It may leave you feeling stressed out. Allow for the fact that there may be delays and take things as they come. If you have to stay over an extra night along the way, it should be part of the fun rather than a major inconvenience. Winter sees local businesses closing early and once you’re on the road, you might find that there’s literally nothing open on a Sunday, so it’s a good idea to make sure you’ve got all the basic supplies you need during daylight business hours. Pack some snacks because you might not be able to find a restaurant open when you get hungry. You may be embarking on an adventure, but there’s no reason for you to be uncomfortable. Pack some basic medications like painkillers just in case you need them. Driving the route 1 in Iceland should not be dangerous in any way, even in winter, as long as you go prepared, take advice from locals and the authorities and treat the roads and the weather with respect. 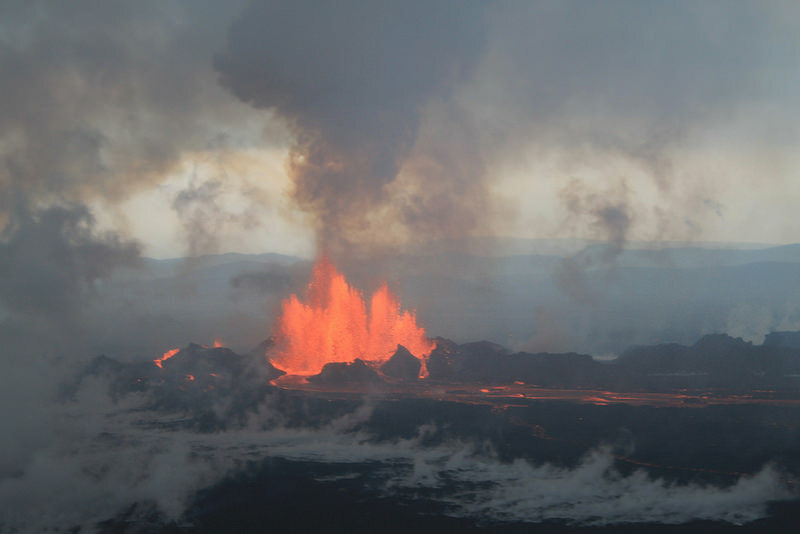 Bárðarbunga is the volcano in Iceland that everyone is watching at the moment. 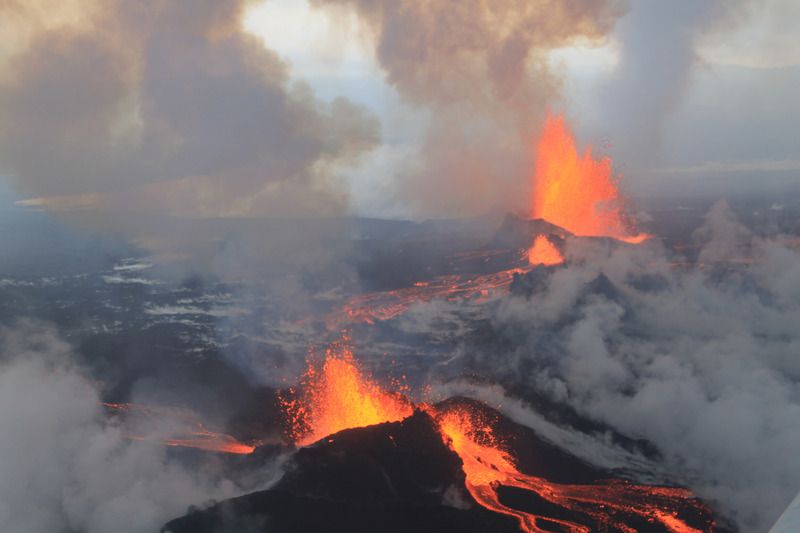 It is the second highest mountain in Iceland and it began erupting spectacularly on the 23rd of August 2014 and continues to spew lava at a rate of around three hundred and fifty cubic meters per second nearly two months later. Peter Hartree, September 4, 2014 via Flickr, Creative Commons Attribution. As of the 22nd of October, geologists report a reduction in lava flow and a reduced frequency in earth tremors and the generally accepted theory is that the eruption might be coming to an end. There is certainly less surface activity: fewer plumes of lava and a reduction in magma emitting from the volcano. Certain experts differ and hold the belief that Bárðarbunga may erupt again at any time. The caldera continues to sink, but at a slightly reduced rate since the initial phases of the eruption when it subsided by about 50 cm per day. Since mid-October, the estimated subsidence of the caldera has reduced to around 40 cm per day. This subsidence is caused by release of magma from the magma chamber within the volcano. As the magma flows out of the volcano, there is less molten rock to support the caldera. At present, the lava flow field is more than 61 square kilometres in area and expanding. At the same time, a huge lake of lava has formed around the Holuhraun fissure. Fountains of lava are less frequent than they previously were, but vast amounts of sulphur dioxide are being released from the eruption site and lava lake. These emissions can be dangerous to human health and the met office in Iceland is monitoring pollution in the area. There is certainly plenty of on-going earthquake activity. Quakes of 3 to 4.9 magnitudes are still measured as occurring at a one to three hour frequency with quakes of a magnitude greater than occurring every twenty to thirty hours. However, it should be borne in mind that the most intense quake measured during October was ‘only’ 5.4. For a number of weeks, these statistics have remained the same. When represented graphically, the graph has a stable, flat line that many interpret as the volcano reaching a point of equilibrium that will signal quieter times ahead, but many believe that the fireworks are far from over. There are concerns regarding a possible glacier – outburst floods in the river Jökulsá á Fjöllum causing a massive displacement of water measuring up to twenty five thousand cubic meters of water which would reach the Holuhran lava field in as little as half an hour. This can have some consequences for the area around Bárðabunga. Driving in Iceland: how are we affected? Driving in Iceland has taken on a new edge, but authorities believe that the Route 1 Ring Road is now safe enough to remain open although access roads closer to the volcano remain closed to all but scientific personnel for safety reasons. A word of caution: Sulphur dioxide pollution occurs variably depending on wind direction and wind speed, so it would be wise to check with the met office regarding any pollution updates before committing yourself to the ring road in the vicinity of Bárðarbunga. The Route 1 ring road is one of the most spectacular drives in the world and remains a popular attraction despite Bárðarbunga’s ongoing eruption. In fact, people seem to be eager to get as close as the can to Bárðarbunga. The Route 1 ring road remains at a ‘safe’ distance and although it was an exciting route before, now has an extra element of adventure owing to Bárðarbunga. Car Rental Iceland – which is cheapest? We at CarRenters decided to take down some prices from randomly chosen car rentals in Iceland to compare to our best prices offered at our site. We decided to make a short price comparison between some conventional car rentals as well as some car rentals renting older cars. The prices represent the cheapest available mid size family cars and 4X4 SUV’s during the first week in July for 7 days. Hopefully the result will give the reader good price awareness. The results are quite stunning where the priciest car rental is roughly 3-4 times more expensive than CarRenters. The obvious reason of the huge price difference is that the cheapest 4 car rentals are offering older vehicles which are cheaper. Here are pictures and direct links to our indisputable winners! In the Reykjavik area there are multiple hiking paths. In this post we will describe the most popular paths. We had especially in mind those who don’t have access to a private- or rental car so the paths listed below are accessible from Reykjavík center, either by foot or public transport. The paths described are easy to hike so guides should not be needed. Mount Esja is one of Reykjavik symptoms. The mountain is 914 meters high and once you are on the top the view will span the whole Capital area, absolutely amazing. This is the most popular walking path near the Reykjavik area. The access point is easy to find, if you have a private- or rental car you will need to drive past Mosfellsbær and take a turn to your right. It’s also possible to take buss number 57 in Háholt Mosfellsbær. There are several hiking paths up the mountain. Each path rated from 1-3 which indicates the difficulty of the path. The most common path is called “Steinn” (e. stone) and drags its name from a big stone that you will see on the end of the path. Depending on the chosen route and walking pace the journey should take from 1-3 hours. Heiðmörk is the largest recreational area near the capital, spanning about 3000 ha in size, one third of that are is forested. Heiðmörk has a wide range of outdoor recreation activity, there are hiking paths that span about 40 kilometers, 9 stopovers where people can come together and enjoy provided barbeque facilities. Please visit heidmork.is for a map. Öskjuhlíð and nearby area is located in the heart of Reykjavik and is a great choice if you want to walk from the city center to some great views by the ocean or see a small version of an Icelandic forest. This is one of the nicest paved path which covers coastline. An ideal beginning of the walk would be at Ægisíða street and take the direction to Nauthólsvík. In Nauthólsvík you could have a stopover and have a coffee at Nauthóll. From there it is a path to Elliðaárdalur which is a beautiful valley where you will cross a fishing river. Moon in Icelandic is tungl and you can’t rhyme with tungl.